Ants are known as persistent, hard workers. So once they find their way into your home or business, it takes knowledge of the right treatment to eliminate them. First and foremost, ant control begins with correct identification of the type of ant that is infesting your home or office. Otherwise the treatment will not be successful. Over the counter products will not do the job to eliminate an ant infestation. At Patriot Pest, we have the knowledge and methods necessary to identify and eliminate an ant infestation successfully. And we mean the entire ant colony. As with termites, we use special products that get to the heart of the problem. This is done by using non-repellent materials that the ants are unaware of. Once they come into contact with the treatment, they carry it back to the colony so that, during their grooming process, they transfer the chemical throughout the colony that kills the entire population. Most of the time, Patriot Pest is able to achieve elimination within a day or two after treatment—much faster than it would take using baits, which often take weeks to work, and then not always successfully. If you have an Ant infestation, please call us today. Don’t waste time and money buying do-it-yourself products that won’t work. We can and will eliminate your problem in one treatment—guaranteed. There are a number of ants that like to invade our homes, the most common are the sugar ants or ants that like sweets, jelly, candy, soda etc. They trail from the exterior of the home through cracks in the walls, electrical outlets, windows, doors, plumbing pipes or any other access they can find in searching for food and water. Ants have become the number one pest for homeowners in the last few years, many homeowners spend hundreds of dollars buying do it yourself products before giving up and calling us. During our inspection we locate the source of the problem—where the ants are coming from—then we treat the source. Then we treat the entire foundation wall. And then we treat a perimeter around the home, including treat all the plumbing pipes, doorframes, window frames and crawl space. 98% of the time we can eliminate the ant infestation in one treatment. The worst ant infestation we have ever seen was a home on Lake Norman in NC, the ants were nesting between the insulation and the subfloor in the crawl space and I mean the entire crawl space. When we pulled down the insulation the subfloor was black there were so many ants. We had to remove all the insulation from the crawl space and treat the entire floor system in the crawl space but we got rid of the ants. Don’t let the ants get this bad before you call us, we can eliminate the problem usually in one treatment. Are fire ants taking over your yard? Have you spent a lot of money buying fire ant products that don’t get rid of the problem? If so, call Patriot Pest today. We will treat the entire yard one time and eliminate them for a year—guaranteed. 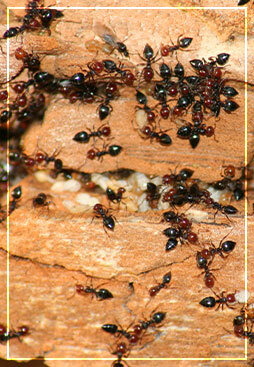 Learn more about our Fire Ant Elimination services here.